I don't think I will ever get over how quickly these weekends seem to fly by. There just doesn't seem to be enough time to do everything that I'd like. Do any of you feel that way, too, or is it just me? 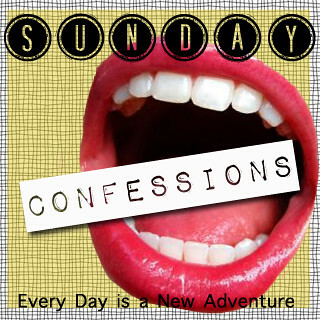 Anyway, time to grab a button and link up for Sunday Confessions! 1. I made my bed yesterday for the first time in two weeks. Usually I'll straighten the blankets and sort of "make" it right before I climb in to go to sleep for the night, but I'm not counting that. This time I actually made it - pillow shams and everything. It's the little things, people! books were kind of tied behind the other two. I do love his writing and his stories, but it's gotten to the point where I've read so many of his books that I can predict what will happen. 3. My good bloggy friend Kim and I have an idea. We are probably going to start a bloggy book club! I know that there are a few out there (if you're interested, Rosie & Kaylee both do one), but we would like to add another to the mix. I mean, what happens if you are part of a different book club and don't really want to read the book they're reading? Or there's always the chance that you won't like the book chosen for our club. Either way, it's cool to have more options, right? We're still working on the details, but we'll let you know once we've got it all figured out! 4. There is a woman at work in another department that always yells into her phone, and it drives me insane. She's halfway across the building, and I can always hear HER over everything else - the phones, the typing, people in my OWN department. Holy balls, woman!! QUIT YELLING! 5. I almost had a heart attack last night watching my Huskers. I don't know what game they were playing, but it definitely wasn't football, and it CERTAINLY wasn't NEBRASKA football. REALLY? A loss to UCLA??? Come on, guys! They're not even good (sorry if you're a UCLA fan)! At least we weren't the only upset - there were a couple others yesterday (Arkansas & Wisconsin). Good thing I have faith in my boys and know that everyone has their bad days. So, what do you have to confess? I confess that I lost a blog follower today, I know it shouldn't make me sad but it always does when it helps. I can't help but think, "what did I do, why don't they like me?" I'm a sap. And I totally think a book club would be fun! Sign me up. I love to read and I think the best part of book clubs is finding awesome books from others that you might otherwise overlook. Did you just start the Mindy Kaling book? Oh My Goodness - did I ever laugh a lot while reading that book. It's definitely one of my favourites. And I loved water for elephants. I read the entire book on the flight home from Thailand to Canada. The only time I ever make our bed is if I'm changing the sheets, or if someone's coming over to visit. Usually, Ammon gets up after I've left the house, so I would have to make it at night, which is a waste! I used to love Nicholas Sparks, and then I got a little bored with every plot line being the same. They're sweet and touching, but nothing really new ever happens. I refuse to read any more Sparks... they are ALL the same and wildly predictable! lol. I think a book club is a great idea! I'm in. Um love the bedspread!!! And the cute collage of pictures! Adorable! Book club! I am in! That's a fabulous idea. I can't wait to read the details! Um, how do you possibly read 4 books in a week? And start two at the same time, isn't that confusing? I started The Hunger Games on 8/29/12 and I'm only on Chapter 12. ha! You must never sleep! I haven't made my bed since I was 17 woops! I'd love a book club! we were supposed to have it on BBN, but only I and the organizer participated in the discussion. even more, everyone voted for a book I didn't like (I'm not really a fan of YA, Hunger Games excluded). i haven't done my bed in a month. trust me, that's true. and i haven't put a sheet on it for 2 weeks. eeeekkk. wow, i wish i have the time to read books that many! A book club sounds fun! If I had any time to read anymore. I never ever ever make my bed...like ever! I used to make my bed every day, now I go through phases when I won't make it for days. lol. Oh well. You need to put that screaming lady in check! haha. I can't handle it when people yell into their phones. 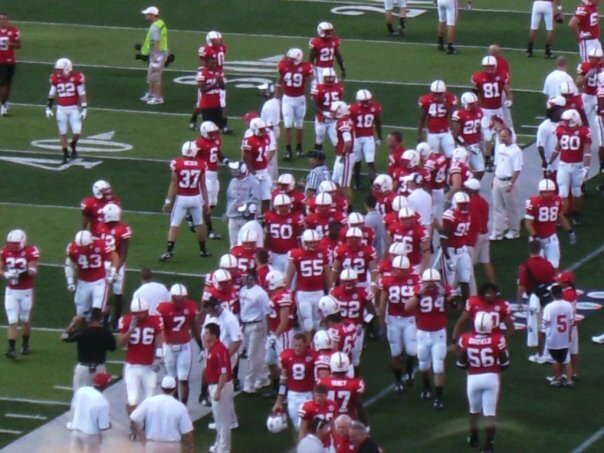 I was at a concert and having a heart attack about the Husker game :( As a Lincoln-ite for 20 years, watching them lose always breaks my heart...but that was just tragic! lol i also never make my bed unless im in a particularly clean-y mood. but then it just gets messed up anyways, but for that one day i feel good about myself! im really excited about the book club and i confess your fervent reading has inspired me to keep searching for great books to read! I've never read or see a Nicholas Sparks book/movie, everyone seems to like it but somehow I never got into it. anyway, I know what you mean how quickly the weeks pass. if only there more weekends in the week instead of week days. I like to make my bed before I get into it too! I thought I was the only one since it really makes little sense. A made bed just feels so much better to get into at the end of the day and in the morning I have zero desire to make it. 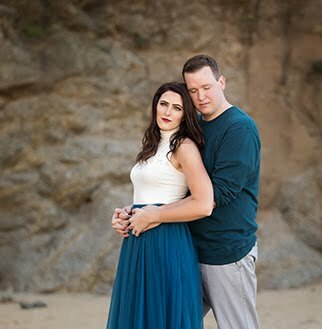 Not sure how I haven't found your blog before now but I'm glad I did! Sorry to say there's a yeller in every office. And even more sorry to say, it's been me on occasion. Just one. One occasion. Yay for book clubs! I'm in! I'm down with joining your book club - keep me posted! Seems your book club needs to be started. hahaha. I'd be totally down for joining. I love the idea of them, and I think reading your opinions on books would be super fun. so definitely keep a sista posted. I confess that I'm about to spend an exorbitant amount of a puppy I've never seen save for a few pictures. I'm nervous, but hoping it all turns out right. I'm also really excited, and think that there's no better time in my life than to do something crazy and irrational. I confess I have to remind myself sometimes that I'm still young and sometimes crazy! This is my first time linking up. I've enjoyed reading the confessions. I tend to make my bed up more when my husband is deployed... I like to keep my house so neat when he's away, and when he's home, I try to keep it neat, but I get beyond frustrated when I make the bed and it's all tidy, but his socks are on the floor and the outfit he wore 2 days ago is tossed in the corner. AND we're not even going to talk about the mess on top of his dresser... Makes me wanna get my own apartment, so it can stay pristine! New follower! I love the idea of a book club... Although it takes me a long time to finish a book lately! Your bedding is really pretty. I love the purple! This is my first time linking up and I'm also a new follower! I gave up on the bed making ever since I moved in with the husband...just seems like extra work at this point...and I'm sad the Huskers are in the big 12 now! I'm rooting for the book club! I'd be up for a bloggy book club!!! 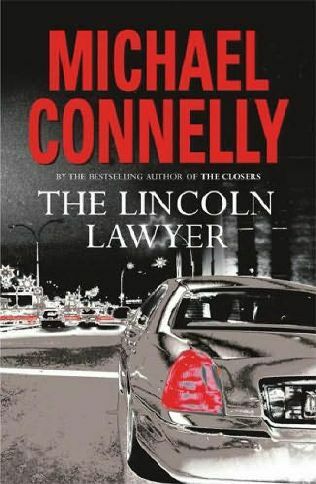 I saw the Lincoln Lawyer movie... it was a good one. Didn't realize it was based on a book! Sign me up for this book club!! I'd love to be a part of your book club! I've been reading a TON lately too. I confess that Saturday's game left me with my own personal little black cloud of doom hanging over my head, and dripping sad raindrops on my person.